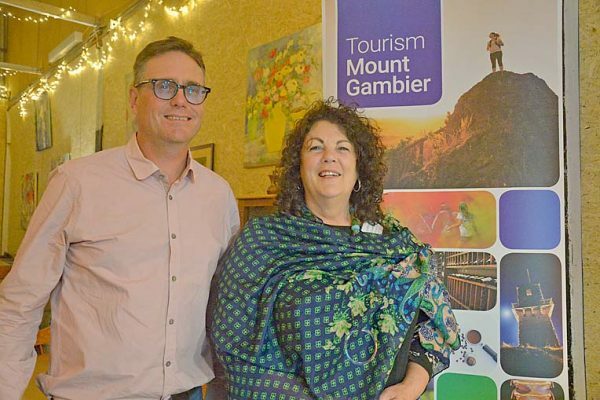 TOURISM TALK: Tourism Mount Gambier chairman Kent Comley welcomes new board member Lyn McLachlan to the team at the recent Talking Tourism event at the Limestone Coast Pantry. INTERNATIONAL students, a Chinese social media account and the launch of a “bucket list” online are the answers to increasing tourism to the city, according to Tourism Mount Gambier chairman Kent Comley. Speaking at the recent Talking Tourism event at the Limestone Coast Pantry, The Barn owner highlighted the group’s plans for the 2018/19 period and goals to increase visitation to the region.